'It Was Going Full, Full Force': Train Crashes Into Hoboken Terminal, Killing 1 : The Two-Way Gov. Chris Christie says 108 people were injured after a train approached Hoboken Terminal at high speed and crashed into the platform. The roof of the New Jersey station has partially collapsed. 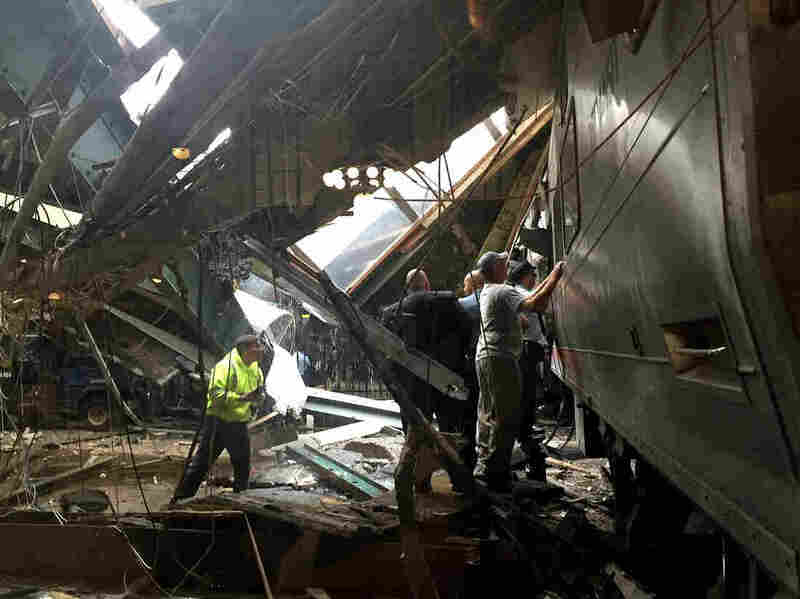 Train personnel survey the New Jersey Transit train that crashed into the platform at Hoboken Terminal on Thursday. For those standing on the platform, there was no warning. But inside the train, in the last few moments, some of the passengers could tell something was wrong. The commuter train was approaching Hoboken Terminal in New Jersey, a crucial commuter hub for the New York City region, during rush hour Thursday morning. And it was going too fast. The train smashed into the barriers at the end of the tracks, crashing through them and into the platform. It took out support beams holding up the ceiling of the Beaux-Arts terminal, and the roof began to collapse. 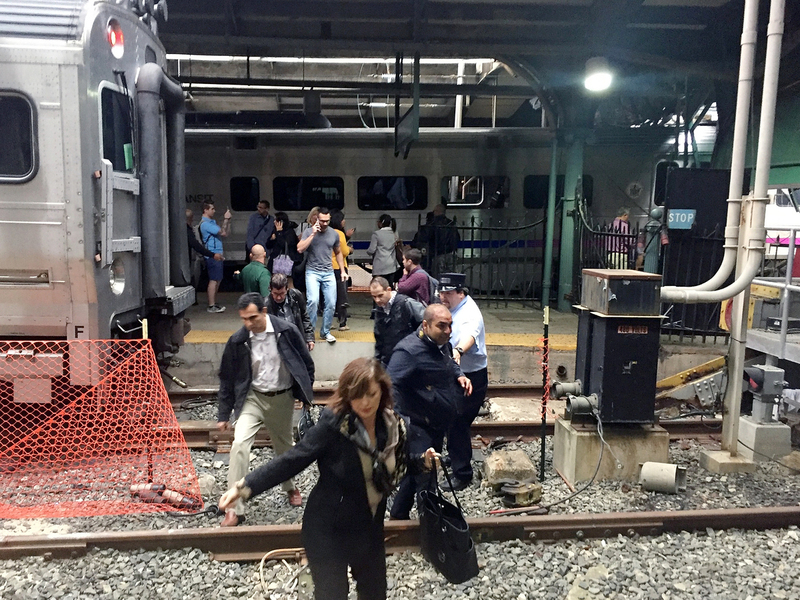 Passengers walk to safety after a NJ Transit train crashed in to the platform in Hoboken, N.J., on Thursday morning. Debris flew around the platform. Passengers inside the train were thrown against seats or to the ground. Then the train came to a halt against the wall separating the tracks from the interior of the terminal, and passengers began to crawl out of the mangled train. A woman on the platform was left dead, struck by debris. She was later identified by the New Jersey State Medical Examiner's Office as 34-year-old Fabiola Bittar de Kroon, of Hoboken. At least 108 passengers and bystanders were wounded, some of them critically. The engineer who was operating the train was critically wounded. "We know what happened," Gov. Andrew Cuomo of New York said Thursday. "We don't know why." He was speaking at a news conference Thursday afternoon, along with Gov. Chris Christie of New Jersey. Christie said there was no indication that the crash was anything but an accident, but he would not speculate about the cause of the crash, saying it was under investigation. The engineer is cooperating with authorities, he said. The train that crashed originated in Spring Valley, N.Y., and "collided with the platform" at Hoboken Terminal at around 8:45 a.m. ET, Cuomo said earlier in a statement. 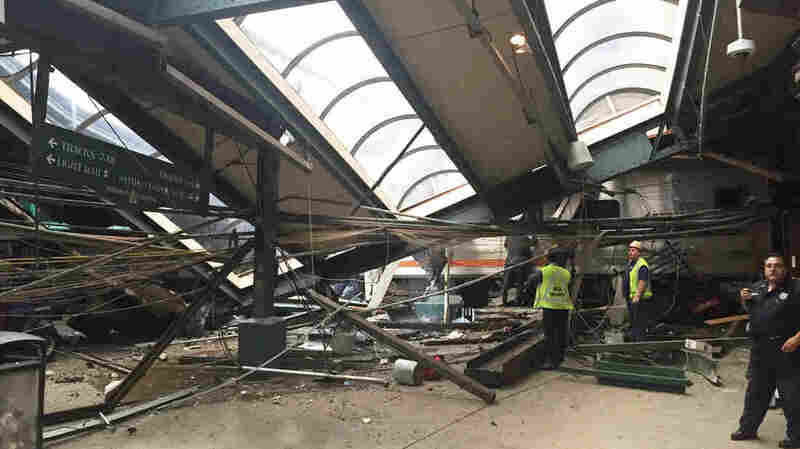 Passengers told Stephen Nessen of WNYC the train approached the station at "full speed" before slamming into the barrier at the end of the track, with the impact throwing riders onto the floor. Witness Mark Cardona says it took him about three seconds to realize what had happened, as the roof started to collapse. He said there had been no warning before the train suddenly smashed into the platform. "It was going full, full force," he told Morning Edition. "There was no way of seeing it coming, of getting out of the way." WNYC's Nancy Solomon arrived on the scene shortly after the crash, witnessing the injured being gathered together before the ambulances had arrived. She says a train had traveled "all the way into the station — not into the waiting room but into the outdoor part where people transfer." A portion of the roof collapsed after a New Jersey Transit train crashed into the platform at Hoboken Terminal on Thursday morning. There was visible structural damage to the historic station building, which is more than a century old and was recently renovated. Water was spraying from the damaged areas, and about a fourth of the roof appeared to have collapsed, Solomon tells our Newscast unit. Solomon spoke to one man who had been a passenger on the train that crashed, in the second car. He said he noticed the train didn't seem to be slowing down as it approached the station, and he braced himself for impact. "People all around him were bloodied," Solomon says. "The train went dark after it crashed. People were screaming, and then they helped each other — there was really no assistance — they helped each other off the train." Witness Ben Fairclough told NPR's Morning Edition he, too, talked to people who were inside the train as it crashed. "They said the train was shaking before it came to an eventual stop and it was moving at a high rate of speed," he says. Afterward, "there were people climbing out of windows, there was water coming down from the top of the ceiling and there did appear to be folks who were unconscious." There is no indication of what may have caused the accident. The Federal Railroad Administration has investigators on site, NPR's David Schaper reports, while the National Transportation Safety Board is sending a "go team" to the site to investigate the cause of the crash. NTSB Vice Chairman Bella Dinh-Zarr said that among other things, the team will look into the possibility that the crash might have been prevented if positive train control, or PTC, were installed. PTC is a complex system that can automatically slow or stop a train if the engineer misses a signal or a locomotive is traveling too fast. NPR's Jeff Brady notes that Congress set a 2015 deadline for America's railroads to implement PTC. That deadline was extended after industry complaints about cost and delays in approval for necessary radio towers. "PTC has been one of our priorities — we know that it can prevent accidents," Dinh-Zarr said. "Whether or not it is involved in this accident, that is definitely one of the things we will look at carefully." Cuomo addressed the question of PTC at the news conference Thursday night, noting it was not yet clear why the train was moving at high speed. "Until you know what caused the problem, you don't know the solution," Cuomo said. 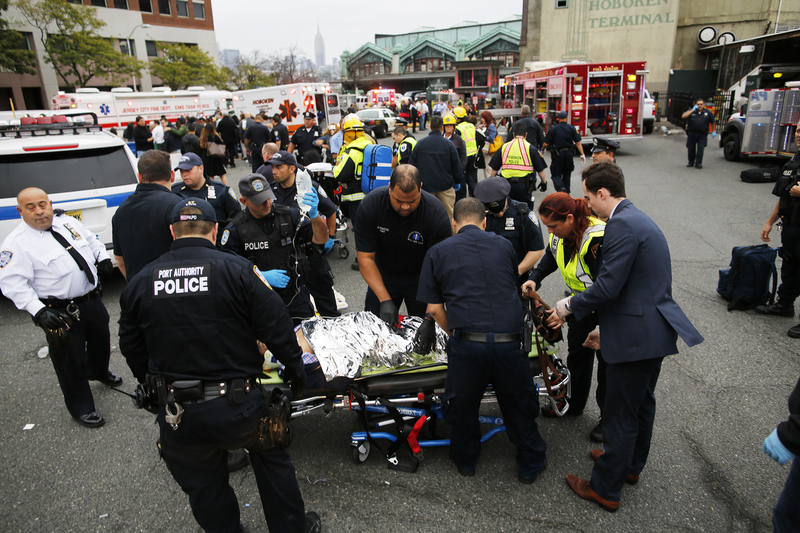 First responders treat injured passengers after a New Jersey Transit train crashed into the platform at Hoboken Terminal during morning rush hour on Thursday. Dinh-Zarr also said the NTSB would be comparing this crash to an earlier crash at the same terminal. In 2011, a PATH train at Hoboken hit the bumper at the end of the tracks, causing minor injuries in several dozen passengers. The NTSB "go team" should arrive in Hoboken on Thursday afternoon, she says. Meanwhile, New Jersey Transit rail service in and out of Hoboken train station has been suspended indefinitely. Local transit authorities are increasing bus services to help commuters make it home. Dinh-Zarr said later Thursday afternoon that it was now safe to recover one of the train's event recorders from the locomotive. "Once we pull that we'll have more information about the speed, and braking, and other issues," she told reporters. She added that there is a second event recorder in the controlling car that was not yet safe to remove owing to the building's collapsed canopy. The two recorders both have outward-facing cameras that will provide different information to investigators, she said. PATH service out of the terminal was temporarily suspended but resumed at 3 p.m. ET, according to the Port Authority. The PATH station at Hoboken is structurally sound, Christie said Thursday. Hoboken Terminal is a major commuter hub, connecting New Jersey Transit commuter rail to PATH trains into New York City. The station averages more than than 15,000 boardings each weekday on New Jersey Transit and 28,000 each weekday on PATH. In an interview with All Things Considered, Hoboken's mayor, Dawn Zimmer, emphasized the importance of the Hoboken Terminal as a transportation hub. "The concern is that the structural integrity of the building has been compromised by this, and that's what we're looking at." She added that it wasn't clear when they would be able to open the heavy rail line. Hurricane Sandy also damaged the Hoboken Terminal in 2012, and Zimmer added that the disruptions were "very, very difficult and actually had an impact on our businesses citywide." The resumption of the PATH train was a positive sign, Zimmer said,"that obviously helps our commuters; we want to make sure that they have a way to get to work and also support the business community as well." The terminal was built in 1907 and was renovated between 2004 and 2011, in a project that restored ferry service and rebuilt a long-missing clock tower. The building is listed on the National Register of Historic Places.